I'm showing three quilts (including my new favorite All the Feels created for QuiltFolk) in a group show of work by artists with studios in the historic American Fabrics Building in Bridgeport CT. 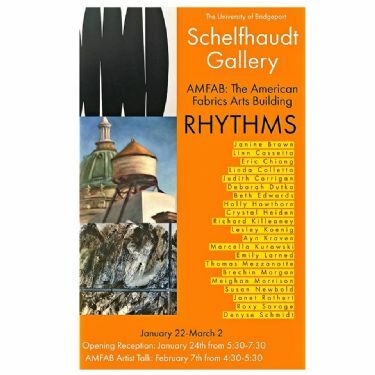 The exhibition, Rhythms, at the Schelfhaudt Gallery at The University of Bridgeport features work across a of wide spectrum of mediums. The exhibition runs from January 24 - March 2. Opening reception is January 24, 2019, from 5:30pm to 7:30 pm. Hope to see you there! Denyse will participate in an artist talk on Thursday February 7th at 4:30 pm.